The lawyer leading the attack on these states’ disclosure laws is James Bopp, a leader of the Christian Right with an uncanny ability to spot weaknesses in campaign finance statutes and obliterate them via the First Amendment….And while his clients in these cases are usually religious or conservative groups, the biggest beneficiary of these efforts has been, almost exclusively, corporate America. ….Bopp has already succeeded in keeping the Ref. 71 names under wraps for a year, winning an injunction from a federal district court in Washington. The 9th Circuit Court of Appeals reversed that decision, but then the Supreme Court reinstated the injunction and agreed to hear the case. The high court’s interest in Reed should trouble anyone unhappy about the court’s overreach in Citizens United. If the court finds that petition-signers deserve anonymity, it’s not much of a stretch for it to decide that campaign donors should also be shielded, lest they get nasty emails about their political views. I’m a little nervous about this. Obviously Bopp and his cause don’t evoke much sympathy from us liberals, but I’m not sure that I’m not on his side here. 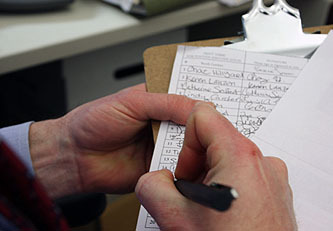 To me, signing an initiative petition seems more similar to voting than it does to giving money to a candidate. It’s one thing to take the risk of making your political views public if you take the active step of contributing to a candidate or a cause, but it strikes as quite another thing to take that risk for the very routine step of signing an initiative petition. It’s simply not clear to me what the public good is in allowing this. The big concern, of course, is that “it’s not much of a stretch” to decide that campaign contributions should be kept private too. But I don’t see that. Substantively, there’s a huge difference: knowing where money is coming from is fundamental to even the most limited kind of campaign finance regulation. If you strike that down, you’ve essentially wiped out the power of Congress in this area almost entirely. Conversely, keeping the names on initiative petitions private has virtually no knock-on effects at all. Practically, I’m not sure I see the slippery slope either. If a majority of the Supreme Court decides that campaign contributions can be kept private, then that’s how they’ll rule. I don’t think they need to sidle up to it slowly by ruling on initiative petitions first. But I guess here’s my challenge, and it’s an honest one: can anyone explain to me the social good that comes from making names on initiative petitions public? On the downside, it will make people less likely to sign petitions,1 and it also opens them up to potential harrassment from opponents and employers2 — not to mention fundraising pitches from fellow travelers. On the upside — what? I can’t think of any argument that wouldn’t also apply to exposing my votes to public scrutiny. But school me in comments if you think I’m missing something. 1Which, admittedly, some might see as an upside. But that’s just snark, not a serious public policy argument. 2I’m thinking here of, say, a secretary in a Mormon church who signs a petition in favor of gay marriage and finds his name on the internet a couple of months later. How long would it be before someone in the church office figured out an excuse to fire him?